Planting more trees in cities may be a solution to rising temperatures say scientists, who claim tree cover could reduce urban heat by 12 degrees. American researchers have explored possible coping techniques as cities across the globe continue to experience record breaking summer temperatures. A study has found that the shade caused by large and leafy trees can have a “profound cooling effect” of up to 12 degrees. Professor Monica Turner from the University of Wisconsin-Madison investigated the effects and how trees can be used in the future to prevent rising global temperatures. One researcher cycled up to 500 miles around the city with a small weather station strapped to the back of her bike to gather data on temperature and micro climate. Prof Turner said: “Cities worldwide are experiencing record-breaking summer air temperatures, with serious consequences for people. “As cities warm and the need for climate adaptation strategies increases, a more detailed understanding of the cooling effects of land cover across a continuum of spatial scales will be necessary to guide management decisions. “We knew that cities are warmer than the surrounding countryside, but we found that temperatures vary just as much within cities. The study’s co-author from the American university’s department of Integrative Biology said urban temperatures could fall by 12 degrees if an adequate number of trees are planted in cities. Professor Turner said roads, paths and buildings absorb heat from the sun during the day and slowly release the heat during the night. Meanwhile trees cool down air temperatures by shading surfaces from the sun and releasing water through their leaves. But for this to be achieved, more than 40 per cent of a city will have to be covered by a leafy and shaded “tree canopy”. Lead author of the study published in the Proceedings of the National Academy of Sciences, Assistant Professor Dr Carly Ziter gathered data by attaching 150 air temperature sensors across Madison in Wisconsin. 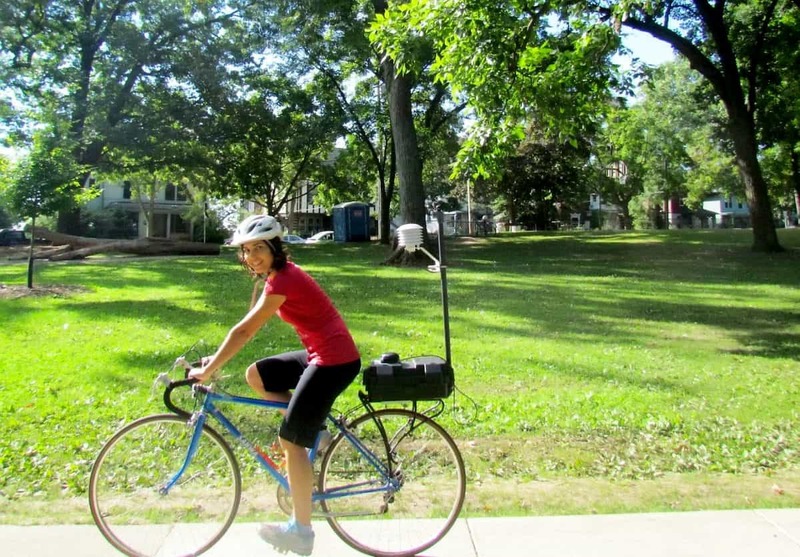 To scale down the data she cycled up to 500 miles around the city with a small weather station strapped to the back of her bike. She would cycle to several areas during different times of the day to ensure accurate and real time data which measured air temperature every five metres. The aim behind her task was to explore data in more detail in the places “we live our daily lives”. Previous studies used satellite images to take ground surface temperature readings – also called the “urban heat island” effect which showed less green areas tended to be a lot warmer than built up concrete jungles. Asst Professor Ziter said: “Tree canopy cover can actually do more than offset the effects of impervious surfaces. “During the day an equivalent amount of canopy cover can cool the air down more than pavement will warm it up. “It’s not really enough to just kind of go out and plant trees, we really need to think about how many we’re planting and where we’re planting them. She suggested city planners should focus on bumping areas that are close to the forty per cent threshold but warned trees should also be planted in areas where people live and are active – not just parks or ‘rich’ places. The professor said: “We don’t want to abandon the lowest canopy areas of our city either as those tend to be neighbourhoods with lower income and marginalised communities. She added the results highlight the importance of urban planning in making cities more livable in the future and different stakeholders must come together to make this happen. Asst Professor Ziter said: “The trees we plant now or the areas we pave now are going to be determining the temperatures of our cities in the next century. “Increased tree cover is suggested as a climate adaptation strategy but the amount of tree canopy cover needed to counteract higher temperatures associated with impervious surface cover is not known. “We used a bicycle-mounted measurement system to quantify the interaction of canopy cover and impervious surface cover on urban air temperature. “Daytime air temperature was substantially reduced with greater canopy cover of more than 40 per cent at the scale of a typical city block of up to 90 metres, especially on the hottest days. “However reducing impervious surfaces remained important for lowering night time temperatures. Previous PostIs Rees-Mogg about to back May’s Brexit deal?